It is interesting to see this Bullseye Bodega Reveals Itself and watch the Bodega concept evolve and slowly unfold like a blossoming flower. As predicted a post or two ago, the promotion has spread from South Central PA, to the Lehigh Valley, to most recently Northeast PA. What originally appeared to be a rebranding of the entry discount area, now shows itself to have possibility in some stores of a full-blown, rear-of-store discount department with an overhead canopy and perimeter signing of its own. Ceiling signage at key intersections points the way to the Bodega at store rear, pulling shoppers through the store to the best bargains. 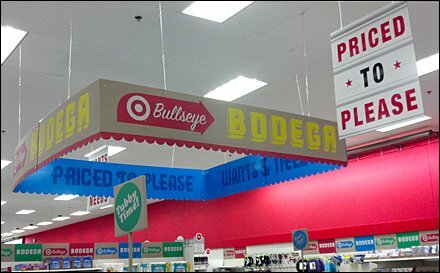 See the Bullseye Bodega Reveals Itself thumbnail for a view of aisle signage from a distance. Again this is only haphazard personal experience. 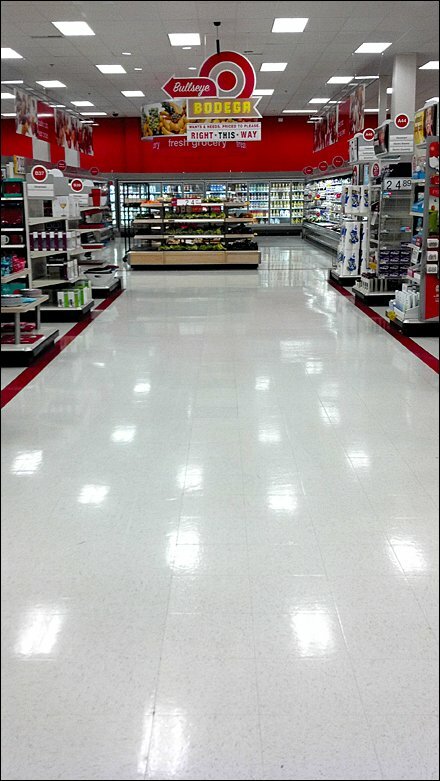 Across at least 9 locations the in-store experience and status of setup is different. So who can say what the Bullseye Bodega will be chainwide when rollout completes and the promotion is mature. For Hispanic and Latino posts by Title see..